Welcome to the final post in our 3-part MongoDB 3.4 blog series. In part 2 we covered the enhanced capabilities for running mission-critical applications, including geo-distributed MongoDB zones, elastic clustering, tunable consistency, and enhanced security controls. We are concluding this series with the modernized DBA and Ops tooling available in MongoDB 3.4. Remember, if you want to get the detail now on everything the new release offers, download the What’s New in MongoDB 3.4 white paper. MongoDB Compass is the easiest way for DBAs to explore and manage MongoDB data. As the GUI for MongoDB, Compass enables users to visually explore their data, and run ad-hoc queries in seconds – all with zero knowledge of MongoDB's query language. The latest Compass release expands functionality to allow users to manipulate documents directly from the GUI, optimize performance, and create data governance controls. DBAs can interact with and manipulate MongoDB data from Compass. They can edit, insert, delete, or clone existing documents to fix data quality or schema issues in individual documents identified during data exploration. If a batch of documents need to be updated, the query string generated by Compass can be used in an update command within the mongo shell. Trying to parse text output can significantly increase the time to resolve query performance issues. Visualization is core to Compass, and has now been extended to generating real-time performance statistics, and presenting indexes and explain plans. The visualization of the same real-time server statistics generated by the mongotop and mongostat commands directly within the Compass GUI allows DBAs to gain an immediate snapshot of server status and query performance. If performance issues are identified, DBAs can visualize index coverage, enabling them to determine which specific fields are indexed, their type, size, and how often they are used. Compass also provides the ability to visualize explain plans, presenting key information on how a query performed – for example the number of documents returned, execution time, index usage, and more. Each stage of the execution pipeline is represented as a node in a tree, making it simple to view explain plans from queries distributed across multiple nodes. If specific actions, such as adding a new index, need to be taken, DBAs can use MongoDB’s management tools to automate index builds across the cluster. Document validation allows DBAs to enforce data governance by applying checks on document structure, data types, data ranges, and the presence of mandatory fields. Validation rules can now be managed from the Compass GUI. Rules can be created and modified directly using a simple point and click interface, and any documents violating the rules can be clearly presented. DBAs can then use Compass’s CRUD support to fix data quality issues in individual documents. MongoDB Compass is included with both MongoDB Professional and MongoDB Enterprise Advanced subscriptions used with your self-managed instances, or hosted MongoDB Atlas instances. 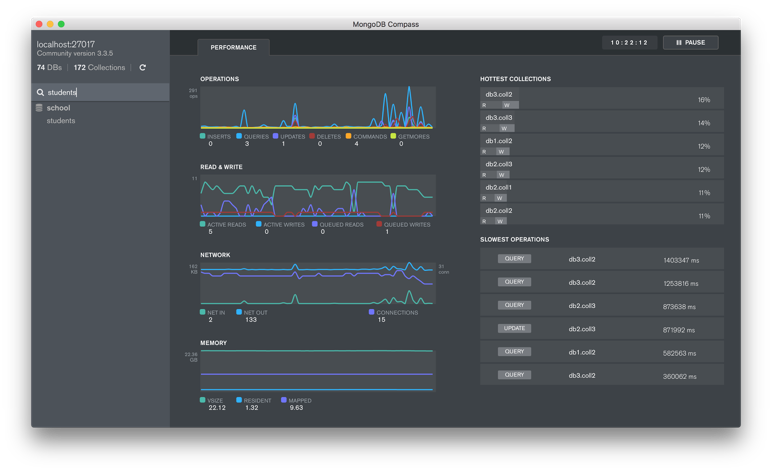 MongoDB Compass is free to use for evaluation and in development environments. You can get MongoDB Compass from the download center, and read about it in the documentation. Ops Manager now allows telemetry data to be collected every 10 seconds, up from the previous minimum 60 seconds interval. By default, telemetry data at the 10-second interval is available for 24 hours. 60-second telemetry is retained for 7 days, up from the previous 48-hour period. These retention policies are now fully configurable, so administrators can tune the timelines available for trend analysis, capacity planning, and troubleshooting. Generating telemetry views synthesized from hardware and software statistics helps administrators gain a complete view of each instance to better monitor and maintain database health. Ops Manager has always displayed hardware monitoring telemetry alongside metrics collected from the database, but required a third party agent to collect the raw hardware data. The agent increased the number of system components to manage, and was only available for Linux hosts. The Ops Manager agent has now been extended to collect hardware statistics, such as disk utilization and CPU usage, alongside existing MongoDB telemetry. In addition, platform support has been extended to include Windows and OS X. Many organizations are seeking to replicate benefits of the public cloud into their own infrastructure through the build-out of private clouds. A number of organizations are using MongoDB Enterprise Advanced to deliver an on-premise Database-as-a-Service (DBaaS). This allows them to standardize the way in which internal business units and project teams consume MongoDB, improving business agility, corporate governance, cost allocation, and operational efficiency. Ops Manager now provides the ability to create pre-provisioned server pools. The Ops Manager agent can be installed across a fleet of servers (physical hardware, VMs, AWS instances, etc.) by a configuration management tool such as Chef, Puppet, or Ansible. The server pool can then be exposed to internal teams, ready for provisioning servers into their local groups, either by the programmatic Ops Manager API or the Ops Manager GUI. When users request an instance, Ops Manager will remove the server from the pool, and then provision and configure it into the local group. It can return the server to the pool when it is no longer required, all without sysadmin intervention. Administrators can track when servers are provisioned from the pool, and receive alerts when available server resources are running low. Pre-provisioned server pools allow administrators to create true, on-demand database resources for private cloud environments. You can learn more about provisioning with Ops Manager server pools from the documentation. Building upon server pools, Ops Manager now offers certified integration with Cloud Foundry. BOSH, the Cloud Foundry configuration management tool, can install the Ops Manager agent onto the server configuration requested by the user, and then use the Ops Manager API to build the desired MongoDB configuration. Once the deployment has reached goal state, Cloud Foundry will notify the user of the URL of their MongoDB deployment. From this point, users can log in to Ops Manager to monitor, back-up, and automate upgrades of their deployment. MongoDB Ops Manager is available for evaluation from the download center. Whichever architecture is chosen, administrators gain all of the benefits of Ops Manager, including point-in-time recovery of replica sets, cluster-wide snapshots of sharded databases, and data encryption. You can learn more about Ops Manager backups from the documentation. The MongoDB Atlas database service provides the features of MongoDB, without the operational heavy lifting required for any new application. MongoDB Atlas is available on-demand through a pay-as-you-go model and billed on an hourly basis, letting developers focus on apps, rather than ops. MongoDB Atlas offers the latest 3.4 release (community edition) as an option. In addition, MongoDB Atlas also now offers AWS Virtual Private Cloud (VPC) peering. Each MongoDB Atlas group is provisioned into its own AWS VPC, thus isolating the customer’s data and underlying systems from other MongoDB Atlas users. With the addition of VPC peering, customers can now connect their application servers deployed to another AWS VPC directly to their MongoDB Atlas cluster using private IP addresses. Whitelisting public IP addresses is not required for servers accessing MongoDB Atlas from a peered VPC. Services such as AWS Elastic Beanstalk or AWS Lambda that use non-deterministic IP addresses can also be connected to MongoDB Atlas without having to open up wide public IP ranges that could compromise security. VPC peering allows users to create an extended, private network connecting their application servers and backend databases. You can learn more about MongoDB Atlas from the documentation. 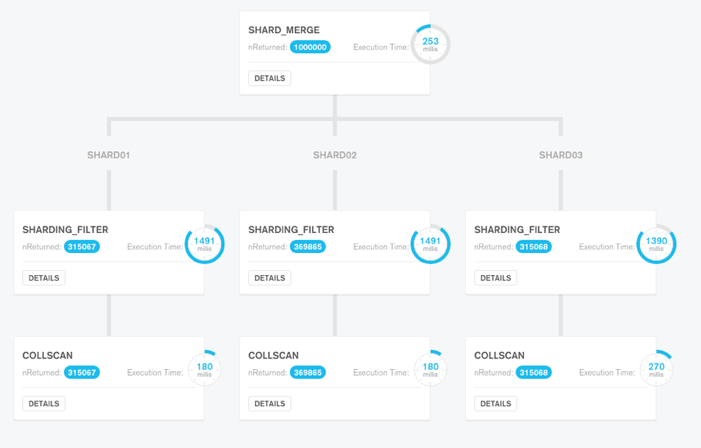 Native graph processing, faceted navigation, richer real-time analytics, and powerful connectors for BI and Spark integration bring additional multimodel database support right into MongoDB. Geo-distributed MongoDB zones, elastic clustering, tunable consistency, and enhanced security controls bring state-of-the-art database technology to your most mission-critical applications. Enhanced DBA and DevOps tooling for schema management, fine-grained monitoring, and cloud-native integration allow engineering teams to ship applications faster, with less overhead and higher quality. Remember, you can get the detail now on everything packed into the new release by downloading the What’s New in MongoDB 3.4 white paper.